So after my first post about this Spring Awakening I was having, in true New York “spring” form it snowed. With the temperature heading back into the 30s, I was craving a night of good tivo and something warm in my belly. 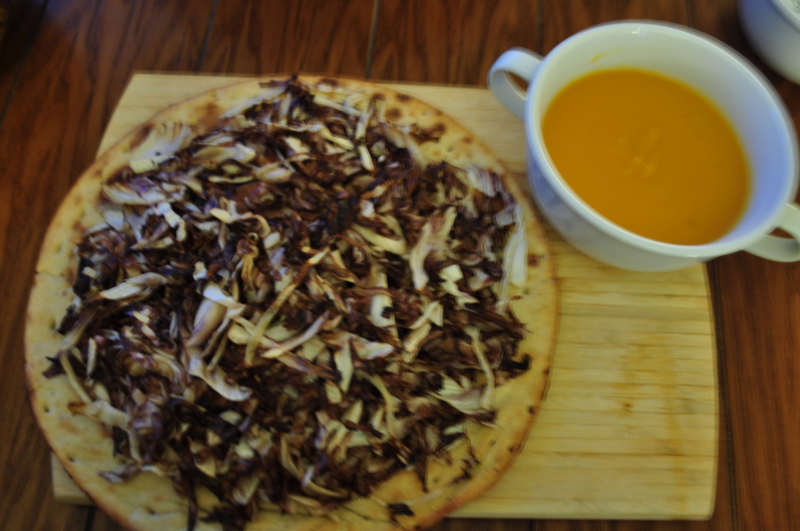 A little unmotivated to do a monster amount of dishes on tivo night, I decided to make Alicia Silverstone’s radicchio pizza from thekindlife.com and a butternut squash soup. What’s great about this menu is that it has few ingredients, the preparation is easy and it is quite nutritious! Place radicchio on pizza and allow the soup to reheat as the pizza is finishing baking. Dress with olive oil, salt, pepper, and a few dashes of white truffle oil to taste. Toast the pizza crust in the oven for 7 minutes, or until it is heated through and slightly golden, but not crunchy. Scatter the dressed radicchio over the pizza crust and return to the oven for another 3-5 minutes, until the radicchio is warm and just starting to wilt. 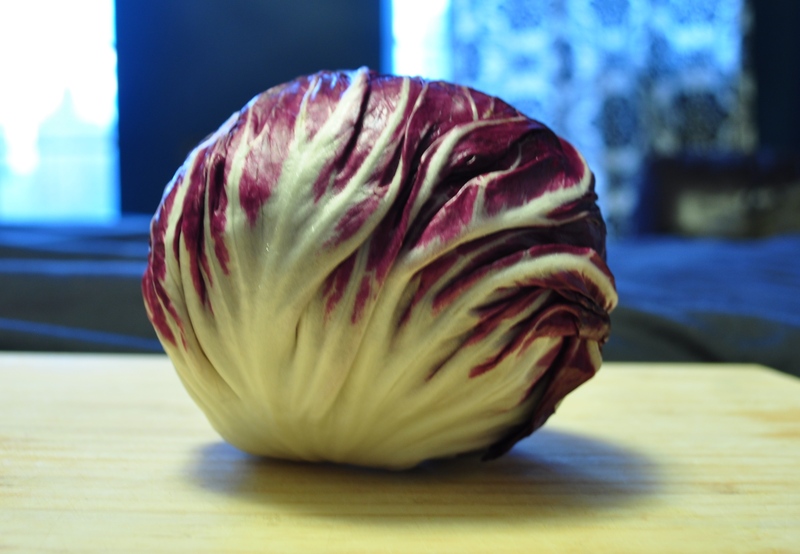 It has such a beautiful purple color and according to radicchio.com it provides an antioxidant content rivaling that of blueberries and spinach. Butternut squash soup was the first type of soup that I explored making back when I was living in San Francisco and over the years I think almost every roommate, friend, and family member of mine has had a bowl or at least a bread dip of it. It has been made in many kitchens and in many forms, but I think this last batch was one of my best. One suggestion I would like to make is to get yourself a hand blender. I just purchased the Cuisinart Smart Stick Hand Blender about a month ago and my cooking world is infinitely easier. Before I used to use a regular blender and the process of pureeing the soup in sections though doable is much more time-consuming and I never manage to not make a mess. Also as I mentioned before, it was tivo night and my dishwasherless self prefers not to hand wash a blender! I use mine all the time for soups, smoothies, and even margaritas! Flip upside down (skin side up) and place squash in a baking pan or on a cooking sheet puncturing the skin a few times with a fork. Add coconut milk and take off the heat. Put back on low heat again to warm the soup back up and then SERVE! This entry was posted in Recipes and tagged butternut squash, food, radicchio, recipe, soup. Bookmark the permalink. I was literally at trader joe’s with butter nutt squash in my hand but put it back bc I was clueless of how to make the soup!! Will get to work asap. Oh thanks for the comments girls! i can’t wait to hear how your soups turn out! 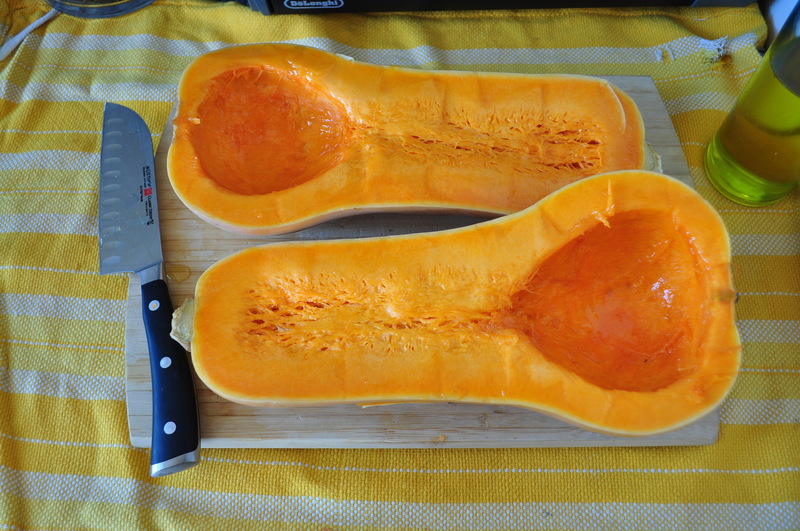 Butternut squash is my fav! I’m getting the hand blender and making the soup this week! Please continue to post the great soup recipes, as that is definitely my favorite food and when made at home it’s easier to control the amount of sodium. Ashleigh, you’re so right about the more control of sodium you have when creating your own soup. There’s nothing more frustrating when you’re at the store and want to just pick up something quick and easy and then you check out the label and your “healthy” choice is filled with sodium. For example, Campbell’s condensed Vegetable soup though is only 100 calories per serving, has 890mg of sodium! That’s 37% of the recommended daily value! Always a better option to make your own food so you know exactly what you’re putting in your body.